The most glaring problem I saw was the pole and myriad telephone lines distracting from the main subject of the photo. So they were the things I took care of first, creating a new layer entitled “clone stamp” and using the clone stamp, healing brush, and paintbrush tools to clean everything up. This was rather painstaking, taking about 40 minutes to do since some of what I was removing was in heavily detailed areas, like the white house on the right and the tiles on the main building. For quite some time, I would have told you that my favourite programs out of Adobe’s Creative Suite were Illustrator and InDesign, respectively (depending on the task at hand). While Photoshop was the first program I ever used from Adobe, my personal projects and work projects land me in the other two programs far more often. After all, I’m a graphic designer, not a photographer. Nevertheless, after learning Illustrator and InDesign and finding them to be very intuitive and user-friendly, I harbored a bit of resentment towards Photoshop, believing it to be needlessly complicated and inflated to the point of being complete drudgery to work with. But then, not too long ago, my partner and I discovered the joy that is Aaron Nace‘s Phlearn Photoshop and Photography Tutorials. We spent hours almost every evening for a few weeks watching the tutorials, and it seemed like a whole new world had opened to me. I’ve always been competent in Photoshop, don’t get me wrong. But suddenly it seemed like I could move from mere competency into proficiency. In fact, I must heartily thank Phlearn for making their valuable resources so readily available, as even little tips and tricks I’ve picked up from the show have been so helpful to me in my job as a graphic designer. 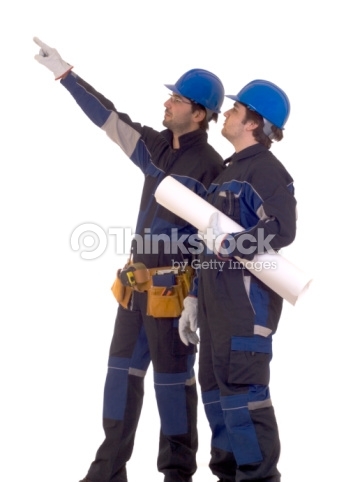 Particularly when working with stock imagery that’s close to what a client wants, but not quite. 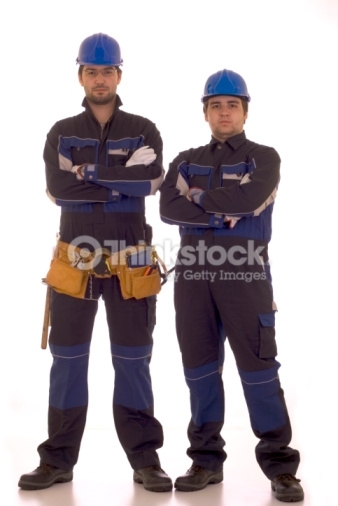 Today’s conundrum in Photoshop Adventures, for example, was a client request to find a picture of two or industrial workers, not in business suits, wearing hard hats but not tool belts, preferably pointing diagonally up at something (the headline of the design project I’m working on for a client). The closest image I’d been able to find was this one, from ThinkStock Photos. The tool belt was an absolute no-go for the client. The color of the jumpsuit was going to clash with my client’s branding, which is a deep teal. As I was unable to find something that was exactly like what the client wanted, I decided to go ahead and try to Photoshop the image I had — something that even six months ago I’d have said was too complicated to complete in a timely fashion. I copied the second photo over into the first, and created a layer mask for the section of torso I needed. Using the Transform tool, I warped and skewed the image to a close approximation of the man’s stance, then used the Liquify tool to clean up the edges a bit. I created a separate layer for cloning/stamping the edges to make sure everything blended well together, along with creating an adjustment layer for adjusting the curves so that it blended tonally with the rest of the image. From there, I created a few more adjustment layers, adjusting the curves, levels, and hue/saturation as needed. I got everything looking pretty great except for the skin tones, which prompted me to create another adjustment layer and mask out just the section of the photo where the men’s faces are. Total time it took? About an hour. Many many thanks to Aaron Nace and the team at Phlearn for giving me the tools to approach and solve design problems! 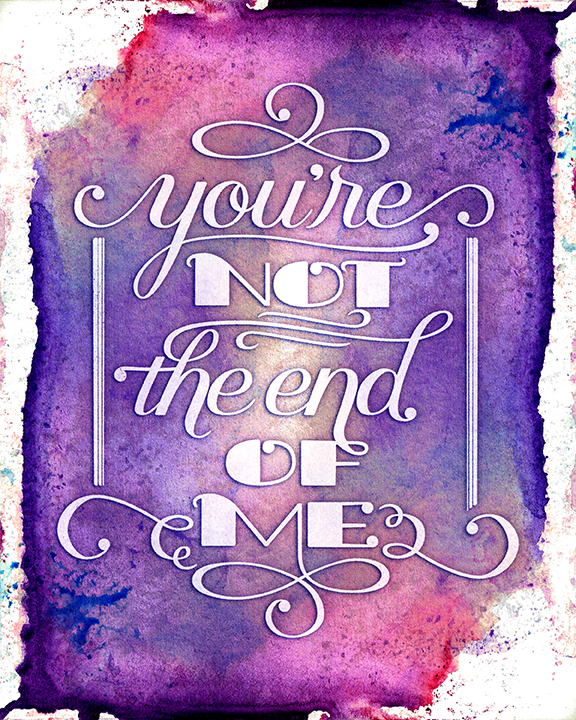 I do a lot of custom typography and lettering in my graphic design and personal calligraphy work. I aspire to create vector images that are clean, crisp, and intuitively drawn so as to make the job easier for the next designer who has to touch my work. As I continue to read and watch tutorials from experts in the business, like Jessica Hische and Sean McCabe, I’m really enjoying pushing myself to adopt best practices and really hone my craft. I really enjoyed this tutorial quite a bit. Last night, I sketched and then lettered a line from Meghan Tonjes‘ powerful song, “Oh, Father.” I sketched and erased and sketched and erased until I was sure I had the letterforms and layout about how I wanted it. When I’m doing a conceptual sketch like this, I’m not very fussed about getting everything perfect. I know I’ll be going in and vectoring soon thereafter, and I’m more concerned with expressing an emotion than I am with perfection of form. So today over my lunch break, I cleaned up the image in Photoshop, then took it into Illustrator and ran the dreaded lazy Live Trace on the image. I’ve taken to doing this with a lot of my lettering, because it gives me a rough vectored outline of all the shapes I’ll be working with, so I can move things around a little bit and get my layout nailed down, then focus on perfecting the letterforms themselves. I’ve been really interested in seeing how typographers and letterers I admire vector their artwork, and so this evening, I’ve been trying to incorporate their practices into this round of vectoring. Namely: using as few anchor points as possible and making sure my handles are all at 90 degree angles to really fully utilize the power of bezier curves in typography. It took me an embarrassingly long time to really understand how powerful bezier curves are. My first light-bulb moment came in my computer illustration class in college, while watching my classmate use the pen tool for a few moments. I suddenly realized it was exactly like what I had learned in pre-calculus the year before. (Oh, to be young and understand math again!) But for far too long after that, I was quite prone to using too many anchor points and under-utilizing my handles. As I’ve grown as a designer, I’ve been moving towards simplicity in my vector images, particularly as I work more and more with custom typography and vectoring my own lettering work. While frustrating at first, I’m finding that it really is producing much more natural and graceful curves, even if I have to work a little harder at them. I’m really thrilled with the result so far, and can’t wait to continue and then show the final piece. Final pieces! I’m really pleased with how this turned out. So clean and clear while still retaining the personality of the original inking. I created a one-color version for T-shirts and other products, and a full-color version for prints. All available here! A while ago, a friend asked me about my creative process for my artwork. I’ve been thinking about it a lot, mostly since I feel like I don’t really have a process. I was able to identify 8 things I typically do to stay in shape creatively, and I’m sharing them here with you now, in case you want to be like me! (Or, you know, something.) 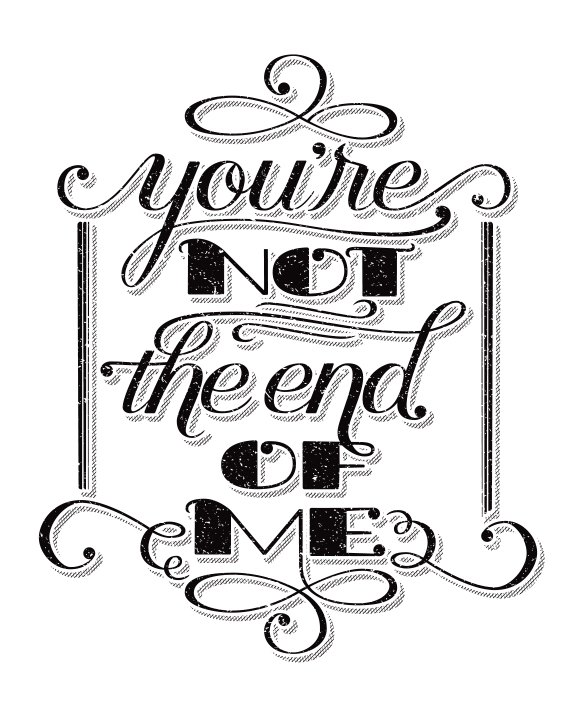 Some of these overlap with my design work as well, but this is pretty specific to my lettering and illustration. Sketch sketch sketch sketch sketch. I carry a notebook and a variety of pens & markers with me at all times for whenever I find a moment to draw. Sketching gets ideas on paper, even “bad” ideas. Sometimes bad ideas are springboards for good ideas. Develop a loose visual language. 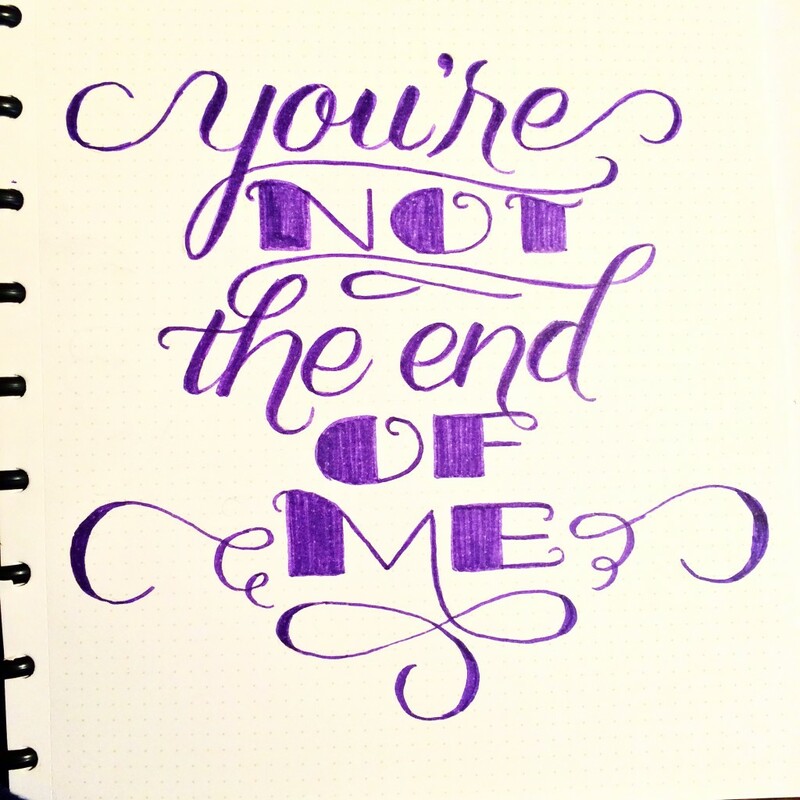 I sort of intuit what lettering or medium lends itself to my subject. Do I want traditional or surprising? Clarity or cleverness? Bold or delicate? Iterate iterate iterate. Do some ink-only sketches & practices — I may come across a layout I hadn’t considered while sketching, something that naturally poured forth from my chosen medium. No better way to get my hands on a piece than to do so repeatedly. Grid it out. Whether using a baseline grid for a type-based layout, or a typical odd column grid, or something more loose, a grid serves to hold a design together. Lists and clip files and pinboards (oh my!). I save what catches my eye or ear. Illustrations that elicit emotions I want to elicit, quotes that I can see in my head lettered out, words or phrases that have meaning to me. Put it away. If I stare at something too long, one of two things happens: I finish a half-assed piece that I think is great in the moment, or I ruin a piece that was done until I messed with it. Space and time gives new eyes and fresh perspective. Let yourself do whatever you need to do. Say when. Endlessly tweak. Give up. Start over (and over and over). Create the same thing in a thousand different ways until you’re sick of it or in love with it. There you have it: finding and making your own creative inspiration. Go forth and create! INFOCUS Marketing acquired a 25 year old print and direct mail firm in June of 2010. 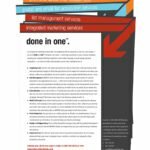 Months before the official acquisition took place, the marketing department needed to come up with a new face for the company as we would be offering our clients and customers a myriad of services beyond list management. Having been a part of the team for months, I had already proven my skill set, so I was tasked with redesigning our corporate materials and a company logo redesign. My goal was to keep the visual language consistent without being overbearing. 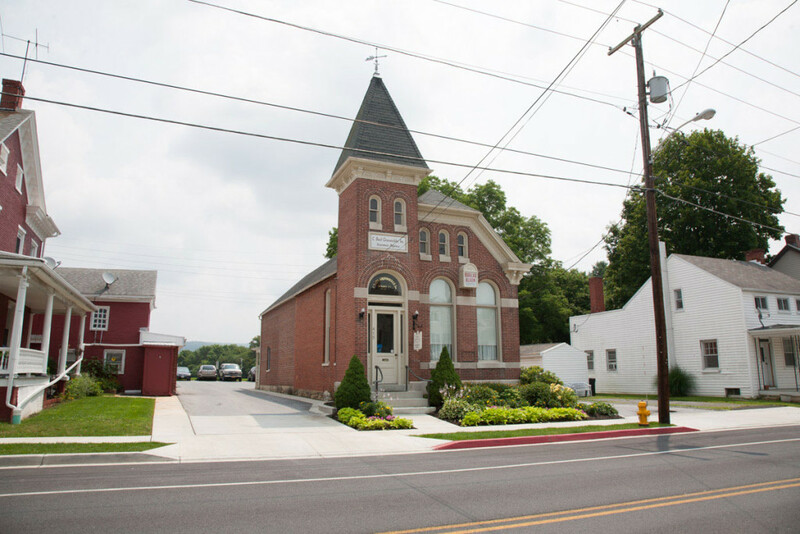 The following gallery shows the rebranding before and after. 2010. 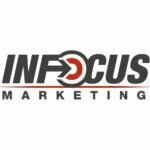 INFOCUS Marketing acquired another business and greatly expanded its suite of services in 2010. The marketing department realized this was a good opportunity to rebrand the company, and with the rebrand came reworking our business cards. We wanted people to know at a glance who the employee was and where they worked. 2010. 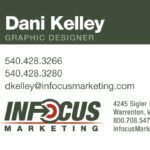 INFOCUS Marketing expanded its services and acquired another company, so a rebranding was in order. An arrow hitting a target had been part of the branding before, along with the basic color scheme, so I tried to keep the same elements while giving them a bit of a fresher look. 2011. 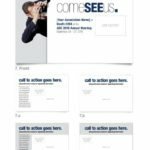 The last piece of the rebranding puzzle for INFOCUS Marketing was our proposal booklets. They were designed with our sales sheets and business cards in mind. 2010. 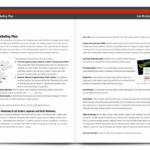 In conjunction with the 2010 rebranding of the company, I was tasked with redesigning our newly rewritten sales sheets. We wanted to keep the design open, strong, but friendly, which we achieved with the rainbow of colors and usage of large lower-case sales sheet titles. 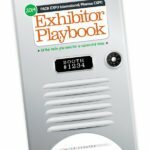 PMMI approached me to design the exhibitor handbook for their co-located PACK EXPO International Pharma EXPO in Chicago. The theme was once again that of a comprehensive playbook, so sports imagery, bold colors, and clean layout were in order to attractively and intuitively lay out the contents of the book. The copywriter, Kwame DeRoché, provided the visual concept of a locker that holds all the information exhibitors need for the show. 2012. 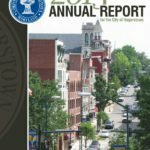 The City of Hagerstown had Icon Graphics create the cover of their popular annual financial report in 2012. The theme was “experience the Hub City,” so we went with the concept of a technilogical hub. 2013. 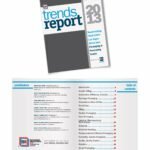 PMMI approached me to design their 2013 trends report. I tried to keep the design bold, simple, and easy to navigate, using a grid to intuitively organize information. 2014. PMMI approached me to design the exhibitor handbook for their co-located PACK EXPO International Pharma EXPO in Chicago. The theme was once again that of a comprehensive playbook, so sports imagery, bold colors, and clean layout were in order to attractively and intuitively lay out the contents of the book. The copywriter, Kwame DeRoché, provided the visual concept of a locker that holds all the information exhibitors need for the show. See more here. PMMI asked me to come up with a concept & a design for the exhibitor handbook for their 2013 PACK EXPO show in Las Vegas. 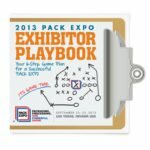 The theme was a playbook, so I decided to go with a clipboard that would be full of “game plans” for the exhibitors. The clipboard was die-cut and slipped into a slit on the front to keep the booklet closed. PMMI and their exhibitors alike were incredibly pleased with the result. 2013. The City of Hagerstown had Icon Graphics create their annual report for 2013. This was its cover. 2013. 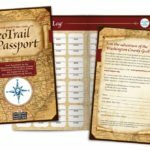 The Hagerstown-Washington County Convention & Visitors Bureau asked the team at Icon Graphics to design the passport for their new GeoTrail. I went with a vintage explorer theme. 2013. PMMI asked me to come up with a concept & a design for the exhibitor handbook for their 2013 PACK EXPO show in Las Vegas. 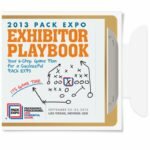 The theme was a playbook, so I decided to go with a clipboard that would be full of “game plans” for the exhibitors. The clipboard was die-cut and slipped into a slit on the front to keep the booklet closed. PMMI and their exhibitors alike were incredibly pleased with the result. See more here. Exhibitor Playbook 2013: Cover flap open. A friend recently recommended the service Freshbooks to me to use with a stray freelance job in which I needed to create an invoice. As a relatively inexperienced freelancer (who works full-time — my freelancing services are offered to friends and acquaintances outside of my company’s client base), I’d never needed to invoice anyone before. Payment usually was just an email sent to my contact with a link to my PayPal account. But this time, my client needed a formal invoice. So when I received an email from one of their staff offering assistance to me at the end of my trial, I couldn’t just delete it as I normally would. I took the time to thank their staff member for reaching out to me and to let him know that my needs were being met with the free option but I loved the service enough to pay when the time comes. Why did I do that? I could have just let the email pass. I’m busy, they’re busy — is it even profitable to take up someone’s time when I’m not ready to close a deal? You see, I love hearing feedback from my clients and customers. I love hearing what I’m doing right, and what I could do to make their experience better. And so I try to do the same for others. I’ve heard it said that there are two types of geniuses: the type whose work makes someone feel that they’ll never measure up, and the type whose work makes someone feel inspired to do better work. Even if what I’m doing could be considered copying someone else’s style (and sometimes rightfully so), I’d rather choose to make myself better than to wallow in self-deprecation. How else will I learn? How else will I be better if I don’t take steps outside my comfort zone? Just don’t take me as saying that it’s okay to copy someone’s work then call it your own. It’s not. That’s called stealing. Nevertheless, there is definitely something to be said for analyzing someone’s work and figuring out what works and how to use it in your own work. Every time I tweet about loving print style sheets (or wishing a site even HAD print style sheets), I get the inevitable reply: “But think of the trees! Why do you need to print something in 2010? !” Well, here’s my answer. Right now, I am sitting with Smashing Magazine‘s “Persuasion Triggers in Web Design” printed in front of me. As soon as I click “publish,” I’ll be turning off my monitor (to hopefully stave off a migraine for a few blessed moments) and turning to this 3-dimensional paper that I can touch. I will pick up my green highlighter, uncap it, and settle in to read what I have been told is a marvelous article, and I will highlight what I want to remember. I may even write notes in the margins. I have literally hundreds of pages of printed articles — some are meticulously organized into notebooks and sub-categories, and some are laying in piles on my dining room table waiting to hole-punched and organized in the same way. Many are highlighted or have notes written on them. Each and every one has shaped my thinking about — and thereby how I practice — design and development and copywriting. Could I have just read the articles online and not printed them? Certainly. I probably could have highlighted and commented them away, too. But, as I hinted at before, I get chronic migraines. One of my triggers is sitting in front of a computer screen for 10+ hours a day, studying and tweaking the smallest pixels. But I love learning. And I don’t want to be tied to my migraine-inducing computer screen in order to learn about web design. On a deeper level, I am a tactile person. I like to feel the paper, I like to interact with it. I like to draw on it and immediately draw connections in my mind. I retain what I’ve read much better away from the screen when my interaction with it is physical and immediate. I feel far removed from my work on the computer. I feel deeply connected to what I actually touch. Maybe I do kill too many trees and I’m not green enough. But I’ve learned that I need to cater to my learning style (and avoid migraines whenever possible). So, until how my brain works changes, I will continue printing articles and scribbling all over them. It’s therapeutic, and gives me a deep connection to what I’m reading.